Greg Rutherford - Aurum Sports Group is an athlete-centered sports marketing and athlete management agency. 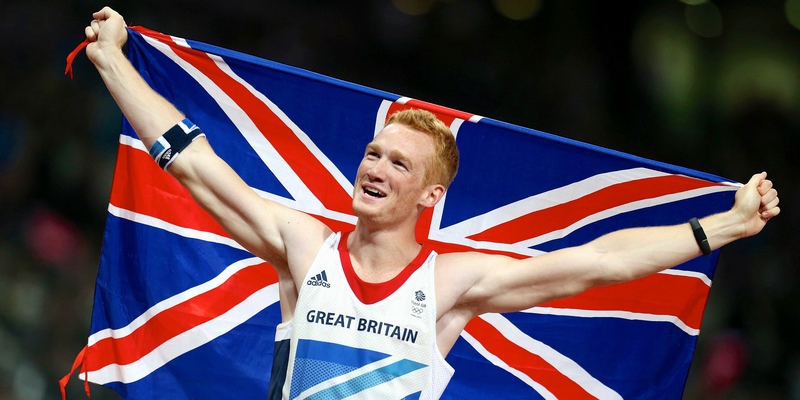 Greg Rutherford is the current Olympic Champion and holds the British Record in Long Jump. Greg was born on November 17th, 1986, in Milton Keynes and has lived there all his life. He has attended his local athletics club since he was at school. Not forgetting his roots he continues to represent Marshall Milton Keynes Athletics Club, recently joined by his father Andy who has showed a late interest in his senior years. In 2005, Greg first jumped into the limelight at the tender age of 18. Greg won the senior title at the AAA Championships for the first time. He then went on to win gold at the European Junior Championships with a jump of 8.14m. This was just the beginning for Greg, and 2006 he managed to secure a silver medal at the European Championships with a jump of 8.13m. Greg’s unstoppable form was to be halted through injury during the season of 2007, with a re-occurring problem affecting his tonsils and also a string of hamstring tears, it became a season he’d rather forget. Even though this prevented the continuation in his well documented jumps he maintains a positive outlook reflecting “Hamstring tears have been a part of my career ever since I became a professional athlete. It is just about learning to manage the knocks and get on with what you need to do.” It was this mature approach to his setback that allowed for him to bounce back to good form in 2008, winning the AAA Championships and securing his seat on the plane to the Beijing Olympics later that summer. Despite still very much being on the road to recovery, at the age of just 21 Greg jumped his way to the Olympic Final. He was third best qualifier with an 8.16m jump, but finished 10th in the final with a 7.84m jump. The early signs of Greg’s unavoidable talents were yet again to gain momentum, setting the UK record for the long jump with a personal best of 8.30m in Berlin at the 2009 World Championships, finishing a credible fifth in the overall competition. However at the Commonwealth Games in Delhi, he jumped his way to the podium, picking up a silver medal with a back-to-form jump of 8.22m, proving that he has the ability to compete against the best. 2011 was another consistent year for Greg in terms of distances jumped, with a season’s best of 8.32m seeing him win the Samsung Diamond League meet in Eugene, USA. That jump placed amongst the top in the world that year, with only a difference of 0.1 m/s preventing it being registered as a new British Record at the time. It was then onwards and upwards to the World Championships in Daegu later in the year however despite entering the Championships in fine form, a devastating hamstring tear on Greg’s second jump in the qualifying competition put an end to his hopes of medal success. Greg entered the London Olympics as the number 1 ranked long jumper in the world and he didn’t fail to deliver by jumping 17cm further than his opponents. In front of an 80,000-strong home crowd, he jumped 8.31m to take Olympic Gold on Great Britain’s most successful day at a Games in 104 years. It was the first time since 1964 that GB had won the long jump, Lynn Davies taking victory in Tokyo. Having led the competition from the second round Greg improved throughout and marked his place in history on Super Saturday. In April 2014, Greg jumped a new British record of 8.51m in Chula Vista, California. Although Greg is best known for his ability in the long jump, he has also shown that he can compete with the best as a sprinter, a quality which naturally aids his jumping due to his speed on the runway. Over his competitive career on the track Greg has continually proved himself, most recently running a personal best of 10.26 seconds at the BUPA Great North City Games in 2011.